Turok 2: Seeds of Evil now also features multiplayer with GOG Galaxy crossplay – enabling you to jump into the fray with the worldwide Turok community regardless of platform. 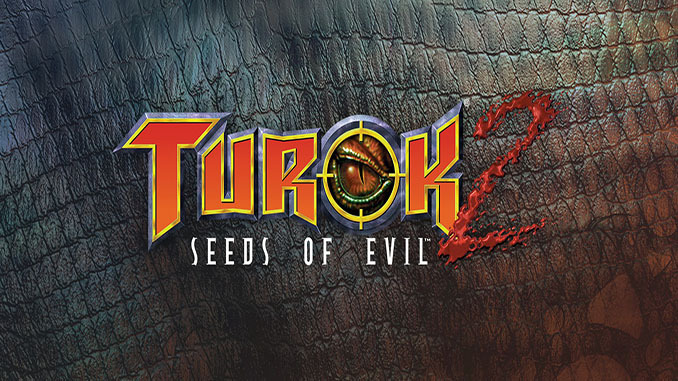 Turok 2: Seeds of Evil returns to the PC! The sequel to the hit game Turok is now available, featuring a host of enemies, weapons, missions, and locations. Remastered for today’s computers using a new engine with improved graphics, Turok 2 will transport players into sprawling environments with vicious enemies lurking behind every corner. – Fight your way through 35 different types of enemies with bouncing bellies, blinking eyes, stretching tentacles and snapping jaws. From Prehistoric Raptors, to evolved Flesh Eaters, to your final battle with the Mother of all beasts— you’ll want to defeat all of them! – Enemies are intelligent! They’re smart enough to attack in groups, to flee when they are outgunned, and to take cover during a firefight. – Enemies flinch and spasm differently depending on which body part you hit. – Conquer 6 engrossing Quest Levels including the Port of Adia, the Death Marshes and the Lair of the Blind Ones. – Unload multiple ricocheting shotgun shells with the Shredder. – Send brains flying with the skull-drilling Cerebral Bore, a fan favorite. – Stomp enemies flat while riding an artillery-mounted Triceratops! – Ported to the Kex Engine 3.4. – Brand new UI system. – Shadow maps and compiled light maps. – Screen-space reflections on textures and materials. – Dynamic and fixed-resolution sub/super-sampling. – Improved character speed and manoeuvrability, including the ability to grapple ledges. – “Quick warp” feature allows instant travel to any previously visited portal. hi this was an nintendo 64 game and its looking greate can you upload more of the remastered versions of other old games of different consoles plzzzzzzzzzzzzzzzzzzzzzzzzzzzzzzzzzzzzzzzzzzzzzzzzzzzzzzzzzzzzzzzzzzzzzzzzzzzz. from old games like sonic & super mario sunshine these types and other old fps games and again i love your site and also have downloaded many of them and also downloading more of the hidden gems of time. You can find the comment box in the bottom. i have missed in these years i am an addict of the games thank you for searching my request again i love your site and your work see ya.